Sensation involves the relay of information from sensory receptors to the brain and enables a person to experience the world around them. Sensation is input about the physical world registered by our sensory receptors, such as our eyes, ears, mouth, nose, and skin. Perception is the process by which the brain selects, organizes, and interprets sensations; it is often influenced by learning, memory, emotions, and expectations. The human senses include sight, sound, taste, smell, and touch, as well as kinesthesia and the vestibular senses. Input from our senses is taken in through the body’s sensory receptors, which then convert the input energy into neural impulses. These neural impulses enter the cerebral cortex of the brain, where they are interpreted and organized in the process of perception. receptor: Any specialized cell or structure that responds to sensory stimuli. kinesthesia: Proprioception or static position sense; the perception of the position and posture of the body; also, more broadly, including the motion of the body as well. vestibular: Of or pertaining to a body cavity. Sensation and perception are two separate processes that are very closely related. Sensation is input about the physical world obtained by our sensory receptors, and perception is the process by which the brain selects, organizes, and interprets these sensations. In other words, senses are the physiological basis of perception. Perception of the same senses may vary from one person to another because each person’s brain interprets stimuli differently based on that individual’s learning, memory, emotions, and expectations. There are five classical human senses: sight, sound, taste, smell, and touch. Two other senses, kinesthesia and the vestibular senses, have become widely recognized by scientists. Kinesthesia is the perception of the positioning of the parts of the body, commonly known as “body awareness.” Vestibular senses detect gravity, linear acceleration (such as speeding up or slowing down on a straight road), and rotary acceleration (such as speeding up or slowing down around a curve). Both kinesthesia and the vestibular senses help us to balance. Sensory information (such as taste, light, odor, pressure, vibration, heat, and pain) is perceived through the body’s sensory receptors. These sensory receptors include the eyes, ears, mouth, nose, hands, and feet (and the skin as a whole). Rod and cone receptors in the retina of the eye perceive light; cilia in the ear perceive sound; chemical receptors in the nasal cavities and mouth perceive smell and taste; and muscle spindles, as well as pressure, vibration, heat and pain receptors in the skin, perceive the many sensations of touch. Specialized cells in the sensory receptors convert the incoming energy (e.g., light) into neural impulses. These neural impulses enter the cerebral cortex of the brain, which is made up of layers of neurons with many inputs. These layers of neurons in the function like mini microprocessors, and it is their job to organize the sensations and interpret them in the process of perception. fMRI and the senses: This fMRI chart shows some of the neural activation that takes place during sensation. The occipital lobe is activated during visual stimulation, for example. The “motor homunculus” is a theoretical physical representation of the human body within the brain. It is a neurological “map” of the anatomical divisions of the body. Within the primary motor cortex, motor neurons are arranged in an orderly manner—parallel to the structure of the physical body, but inverted. The toes are represented at the top of the cerebral hemisphere, while the mouth is represented at the bottom of the hemisphere, closer to the part of the brain known as the lateral sulcus. These representations lie along a fold in the cortex called the central sulcus. The homunculus is split in half across the brain, with motor representation for each side of the body represented on the the opposite side of the brain. The amount of cortex devoted to any given body region is proportional to how many nerves are in that region, not to the region’s physical size. Areas of the body with greater or more complex sensory or motor connections are represented as larger in the homunculus. Those with fewer or less complex connections are represented as smaller. The resulting image is that of a distorted human body with disproportionately huge hands, lips, and face (because those regions have huge numbers of nerve endings). Motor Homunculus: The motor homunculus is a theoretical visualization of the locations in the cortex that correspond to motor and sensory function in the body. The absolute threshold is the lowest intensity at which a stimulus can be detected. The absolute threshold is the smallest detectable level of any kind of sensory stimulus. There are several factors that can influence the level of the absolute threshold, including cognitive processes, adaptation to the stimulus, and the individual’s motivations and expectations. Sensory adaptation happens when our senses no longer perceive a continuing stimulus. An individual’s motivations and expectations can influence whether a stimulus will be detected at the absolute threshold, and what level of additional stimulus may be needed for an individual to detect the stimulus. sensory threshold: The point at which a stimulus causes a sensation within an individual; below the sensory threshold, there will be no sensation. stimulus: Anything effectively impinging on any of the sensory apparatuses of a living organism, including physical phenomena both internal and external to the body. A threshold is the minimum level at which a given event can occur. In neuroscience and psychophysics, there are several types of sensory threshold. The recognition threshold is the level at which a stimulus can not only be detected but also recognized; the differential threshold is the level at which a difference in a detected stimulus can be perceived; the terminal threshold is the level beyond which a stimulus is no longer detected. However, perhaps the most important sensory threshold is the absolute threshold, which is the smallest detectable level of a stimulus. The absolute threshold is defined as the lowest intensity at which a stimulus can be detected. (Recently, signal detection theory has offered a more nuanced definition of absolute threshold: the lowest intensity at which a stimulus will be specified a certain percentage of the time, often 50%.) A classic example of absolute threshold is an odor test, in which a fragrance is released into an environment. The absolute threshold in that scenario would be the least amount of fragrance necessary for a subject to detect that there is an odor. Smell is not the only sense with absolute thresholds. Imagine you’re in a room and someone behind you slowly begins turning up the volume on the radio; the absolute threshold is the softest volume at which you would notice what they’re doing. Sound thresholds can be about more than volume; they can also be about frequency. For example, humans cannot hear dog whistles. This is because dog whistles are at a frequency higher than the absolute threshold for frequency for human hearing. Similarly, the minimum amount of light necessary to see something in the dark is the absolute threshold for vision. Every sense has an absolute threshold. 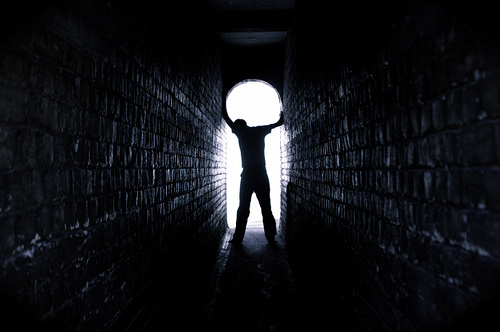 Light at the end of the tunnel: the absolute threshold for vision: In a dark space, an individual’s saving grace can be the minimum amount of light needed to stimulate the eye in the dark environment and alert the brain that it is seeing light. There are several factors that can influence the level of absolute threshold, including adaptation to the stimulus and individual motivations and expectations. Sensory adaptation happens when our senses no longer perceive a stimulus because of our sensory receptor ‘s continuous contact with it. If you’ve ever entered a room that has a terrible odor, but after a few minutes realized that you barely noticed it anymore, then you have experienced sensory adaptation. Like thresholds, adaptation can occur with any sense, whether it’s forgetting that the radio is on while you work or not noticing that the water in the pool is cold after you’ve been swimming for a while. Additionally, an individual’s motivations and expectations can also influence whether a stimulus will be detected at the absolute threshold. For example, when you are in a crowded room where a lot of conversations are taking place, you tend to focus your attention on the individual with whom you are speaking. Because you are focused on one stimulus, the absolute threshold (in this case, the minimum volume at which you can hear) is lower for that stimulus than it would have been otherwise. Expectations can also affect the absolute threshold. If you are in a dark hallway searching for the tiny glow of a nightlight, your expectation of spotting it decreases the absolute threshold for which you will actually be able to see it. The minimum amount of change in sensory stimulation needed to recognize that a change has occurred is known as the just-noticeable difference. The just-noticeable difference (JND) is the smallest detectable difference between a starting and a secondary level of sensory stimulus. This is the difference in the level of the stimulus needed for a person to recognize that a change has occurred. The absolute threshold is the lowest level at which a stimulus can be detected. This is the point in which an odor is finally sensed, or a sound finally heard. The recognition threshold is the level at which a stimulus can not only be detected but also recognized. This is the point where we recognize a certain smell as smoke, or a sound as an alarm. The terminal threshold is the level beyond which a stimulus is no longer detected. This is the point where the sensory stimulus is so strong the sensory receptors no longer detect the stimulus. sensory receptor: A sensory nerve ending that recognizes a stimulus in the internal or external environment of an organism. absolute threshold: The lowest level at which a stimulus can be detected 50% of the time. The just-noticeable difference (JND), also known as the difference limen or differential threshold, is the smallest detectable difference between a starting and secondary level of sensory stimulus. In other words, it is the difference in the level of the stimulus needed for a person to recognize that a change has occurred. Turning Up the Volume: The difference threshold is the amount of stimulus change needed to recognize that a change has occurred. 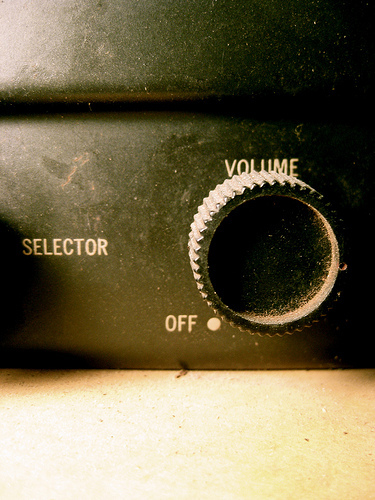 If someone changes the volume of a speaker, the difference threshold is the amount it has to be changed in order for listeners to notice a difference. The JND is usually a fixed proportion of the reference sensory level. For example, consider holding a five-pound weight (the reference level), and then having a one pound weight added. This increase in weight is significant in comparison to the reference level (a 20% increase in weight). However, if you hold a fifty pound weight (the new reference level), you would not be likely to notice a difference if one pound is added. This is because the difference in the amount of additional weight from the reference level is not significantly greater (2% increase in weight) than the reference level. The absolute threshold is the minimum volume of the radio we would need in order to notice that it was turned on at all. However, determining the just-noticeable difference, the amount of change needed in order to notice that the radio has become louder, depends on how much the volume has changed in comparison to where it started. It’s possible to turn the volume up only slightly, making the difference in volume undetectable. This is similar to adding only one pound of weight when you’re holding 50 pounds. Sensory adaptation is the decrease in the responsiveness of a sensory system that is confronted with a constant stimulus. Sensory adaptation involves a gradual decrease in sensory response caused by the repeated application of a particular stimulus over time. Meissner’s corpuscles are sensory triggers of physical sensations on the skin, especially areas of the skin that are sensitive to light and touch. Examples of sensory adaptation include no longer feeling your clothes after you get dressed, no longer hearing the sounds of passing cars and pedestrian chatter outside a city apartment after being exposed to these sounds for a long time, or forgetting the radio or TV is on while you focus on daily activities. corpuscle: A minute particle; an atom; a molecule. Sensory adaptation, also called neural adaptation, is the change in the responsiveness of a sensory system that is confronted with a constant stimulus. This change can be positive or negative, and does not necessarily lead to completely ignoring a stimulus. One example of sensory adaptation is sustained touching. When you rest your hands on a table or put clothes on your body, at first the touch receptors will recognize that they are being activated and you will feel the sensation of touching an object. However, after sustained exposure, the sensory receptors will no longer activate as strongly and you will no longer be aware that you are touching something. This follows the model of sensory adaptation presented by Georg Meissner, which is known as “Meissner’s corpuscles.” Meissner’s corpuscles are sensory triggers of physical sensations on the skin, especially areas of the skin that are sensitive to light and touch. These corpuscles rapidly change and adapt when a stimulus is added. Then they quickly decrease activity, and eventually cease to react to the stimulus. When the stimulus is removed, the corpuscles regain their sensitivity. For example, the constant touch of clothes on our skin leads to our sensory adaptation to the sensations of wearing clothing. Notice that when you put an article of clothing on, after a brief period you no longer feel it; however you continue to be able to feel other sensations through it. This is because the additional stimuli are new, and the body has not yet adapted to them. In contrast, sensitization is an increase in behavioral responses following repeated applications of a particular stimulus. Unlike sensory adaptation, in which a large amount of stimulus is needed to incur any further responsive effects, in sensitization less and less stimulation is required to produce a large response. For example, if an animal hears a loud noise and experiences pain at the same time, it will startle more intensely the next time it hears a loud noise even if there is no pain. There are many stimuli in life that we experience everyday and gradually ignore or forget, including sounds, images, and smells. Sensory adaptation and sensitization are thought to form an integral component of human learning and personality.